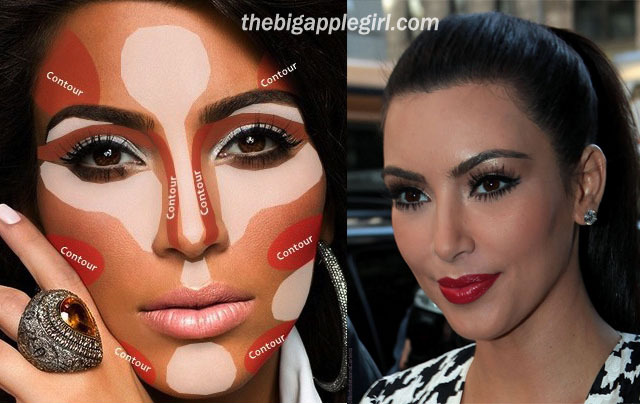 Here's a step by step tutorial based on the photo of Kim Kardashian. Got this from her website. 1. Feel the contours of your face. Apply the contour color directly underneath your cheekbone, extending from the center of your ear in a slightly downward motion. You will want to keep the contour application concise. If your brush feels too fluffy or large, pinch the bristles when you apply, this will give you more control. 2. Use a small eyeshadow brush to softly line both sides of the nose. If your nose is long, you may want to apply a little under the tip of your nose. Again, keep the applications concise. 3. Feel your jaw. You will apply your contour color below your jawbone, making sure not to apply any color to the actual bone. The point is to create a shadow below your jaw. If your jaw is large, you may bring the contour color up on either side of the chin. This will make your jaw appear less bold. 4. Blend your contour color into your hairline. Doing this helps make your face appear slimmer. Make sure to blend well into the hairline. 5. Although your colors may be dramatic, there should be no severe lines. Blend edges well. There you go. Hope that helps! Best for highlighting: MAC Prep + Prime yellow. My face shape is really round but whenever I contour, it changes!